I'm Here. I'm Queer. What the Hell do I read? : What the Hell? - Alabama Judge Who Fought Marriage Equality Wins "Letter From A Birmingham Jail" Award. What the Hell? - Alabama Judge Who Fought Marriage Equality Wins "Letter From A Birmingham Jail" Award. Okay, I don't normally rant, but really, this press release I just received really pissed me off! "April 16, 2015 -Today, Rev. Williams Owens, President and Founder of the Coalition of African-American Pastors (CAAP), announced that Alabama Chief Justice Roy Moore would receive their first ever “Letter from a Birmingham Jail Award” in recognition of Justice Moore’s principled stand in defense of traditional marriage." 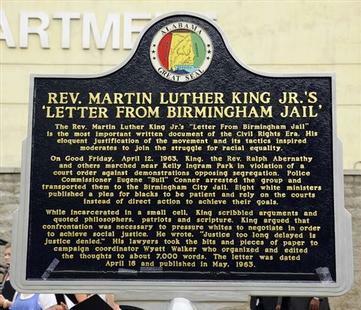 but I think what may rankle the most is that they've named this award after an amazing letter written by Dr. Martin Luther King, Jr., "Letter From A Birmingham Jail." Injustice - continuing institutionalized prejudice - against LGBTQ people is a threat to justice for everyone else, including people of color, the disabled, immigrants, and religious communities. In the United States of America, we hold an ideal that children and teens in school recite as our Pledge of Allegiance daily: "With Liberty and Justice For All." I said it all the years I was in school. My husband said it when he was in school. And our daughter says it every morning. We believe in it. As simple - and powerful - as that. You can read Dr. King's letter in its entirety here. Thanks for reading, and standing up for equality for everyone! I remember when Judge Moore was running for office and caught flack for putting the Ten Commandments on his wall and then when he won he took the Ten Commandments off his wall and stuck them in a closet or a garage someplace. Then when the far right started suggesting he may have been just stringing them along and playing them for saps, Moore foisted upon the citizens of Alabama a Ten Commandments monument the size of a Buick.